Puerto Rico resorts are often spectacular, tropical paradises. They are an ideal place to stay while you are in Puerto Rico – if you can afford it. Resorts don’t come cheap at the best of times but with that said, they are well worth the cost and you may even pick up a bargain if you are lucky enough. Puerto Rico contains the biggest and most luxurious resort brands, just as are found in other parts of the world. These include the Hilton, Hyatt, Radisson, Ritz-Carlton, Marriott and LXR Luxury Resorts. The most notable resorts in Puerto Rico are the El Conquistador Golf Resort & Casino, Hyatt Regency Cerromar Beach Resort & Casino, InterContinental San Juan Resort, Spa & Casino, Marriott San Juan Resort & Stellaris Casino and the Martineau Bay Resort and Spa. People enjoy staying at Puerto Rico resorts as they don’t even have to leave their surroundings to get a taste of the local culture and some enjoyable activities. Other people prefer hotels as they love to get out and see the sights. Both are fantastic choices, and keep in mind that if you do choose a Puerto Rico resort, you are certainly not trapped there! It’s just nice to know that if you don’t feel like heading out that day, you have all you need within a small vicinity of your room. 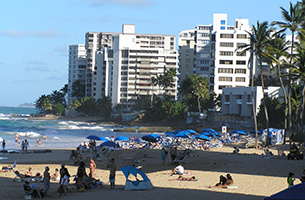 Some of the best resorts and hotels in Puerto Rico are located in San Juan on Isla Verde Avenue. This is a very lively strip and one that is never short of action and festivities for the traveler. The Ritz Carlton is located here as are LXR Luxury Resorts and the El San Juan Hotel & Casino. Puerto Rico is a tropical volcanic island in the Caribbean. Every year thousands of travelers make their way to Puerto Rico, and tourism makes up a large part of the local economy. Puerto Rico resorts can be expensive for the average traveler; however luxury seekers will not be able to resist the temptations that a resort offers. Puerto Rico resorts put you in a prime spot to experience all the adventure and sights of the land. These include kayaking, camping, nature walks, hiking, rock climbing and just general sightseeing. Puerto Rico resorts are an excellent choice of accommodation for your stay on this beautiful island.